The Threaded Lane: I Am So Ready!! As the post title states: I Am So Ready!!! That would be ready for vacation. YAY. Today is my last day of work this week and I am off all next week as well. Fingers crossed that weather will cooperate as we are heading out in our camper for a little bit. Of course, I need to pack for all weather events - cold, heat and everything in between. That's the one downside of camping in the Spring and Fall, but those are our favorite times to get away. The plain vanilla sock in Cascade Heritage - colorway is Baltimore. I'm really enjoying this very relaxing knit. I'll do about 5 more rows or so and then be on the heel flap. This will be going with me on our camping trip. 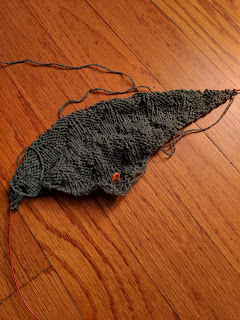 So far the yarn seems to like this pattern and it has been behaving. The pattern is Winter Sea Shawl - a free pattern on Ravelry. I probably will not take this with me. I'm attempting to learn to not take too much knitting. I like to have choices, but I always take way more than I ever work on. And with camping, space is somewhat limited. On the reading front, my Kindle is loaded up and that will be going with me. Recently downloaded from Overdrive are: "The Great Alone" by Kristin Hannah and "Bruno Chief of Police: A Mystery of the French Countryside" by Martin Walker. I'm not sure where I heard about that last, but it is a series that (wherever I saw it) received high ratings. The "real" book I am reading at night is "What She Ate" by Laura Shapiro which is pretty good so far. I'll be reading your blogs on my phone, but I may not comment - sometimes that's awkward on my phone and I'm not taking a laptop or tablet. Enjoy the next week and a half and I'll check in when we are back in town. Keeping my fingers crossed for your weather. We are getting big fat flakes here in NEO. And it's sticking. WAAAH! Have a wonderful, well-deserved vacation! I do hope the weather warms up a bit for you and snow and rain STOP. I was a little concerned that you might not have enough knitting, but if you finish that sock and the second one, maybe you can buy vacation yarn! Have fun! Bon Voyage!!! A camping vacation sounds like fun. Safe travel and enjoy the adventure. I always take extra balls of yarn on trips and find that more often than not, I use them. The Baltimore colorway is nice: I might look for that they next time I purchase sock yarn. That Baltimore colorway is beautiful. Have a wonderful time away and I'll see you when you get back. Have a super vaca...we'll look forward to reading (whenever) all about your R & R! 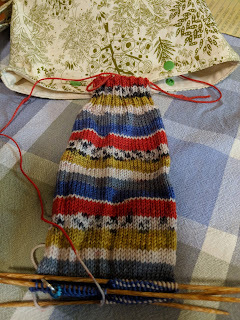 Those kinds of socks are such fun to knit - you want to see what happens next! Have a really wonderful time on your little vacation. Can't wait to hear how it all turns out. Enjoy your time off! I love Cascade; it's from Seattle! I hope you have wonderful weather! They are calling for warmth by the end of the week here. I just hope it sticks! Traveling mercies for wonderful weather. I am so glad you are getting out in the camper!!!! Your knitting is in order!! Wishing you great weather. and I am now going to look up winter sea shawl! Enjoy your down time, hope the weather is good for you! Have a GRAND vacation! Can't wait to hear all about it when you return. love your sock on the needles and the colorway. camper? wow, now I know it's spring even though the temps do not agree, yet. Safe - and fair weather! - travels!! look forward to hearing all about it once you're home! I hope you're having a great vacation! 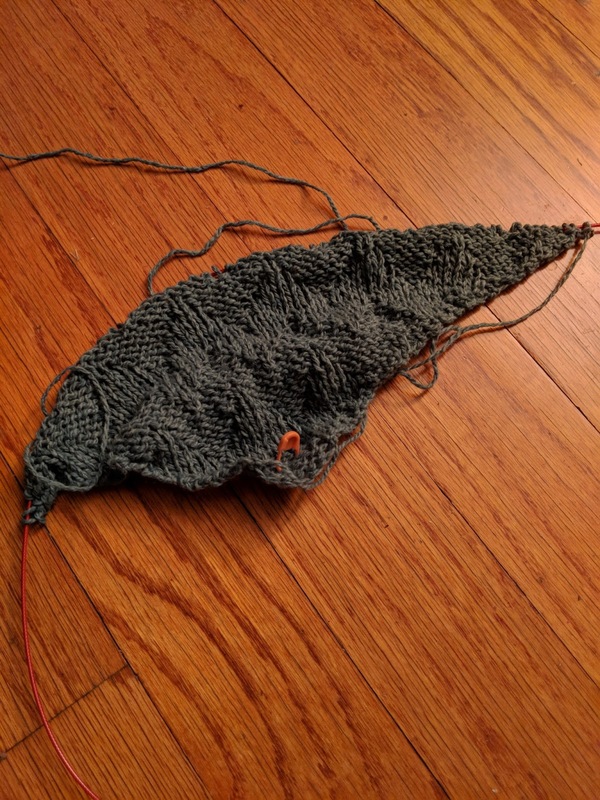 Sock looks great, as does the shawl start. Glad you had fun at the fiber festival. I saw some other pics -- looks like a nice sized festival. Sometimes a smaller one is nice.